Cosmetic dentistry is the most popular method of professional treatment for patients seeking to improve the beauty of their smiles. This field of dentistry focuses on creating benefits for the appearance of the teeth and mouth. Cosmetic dental treatments can result in beautiful, engaging smiles that make patients feel more positive and happy about their life. The Boston cosmetic dentist at CITIDental Tremont can provide a number of cosmetic treatments that enhance your smile. 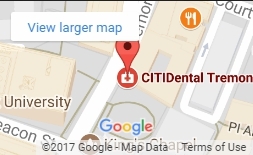 Whether you have damaged, missing, discolored, or stained teeth, CITIDental Tremont offers a number of services. There is no need to be referred to other specialists. Your cosmetic procedures will be performed and supervised at CITIDental Tremont in a manner that accommodates your schedule. There are various cosmetic dentistry treatments available. These include dental veneers, teeth whitening, tooth-colored fillings, dental bonding, inlays, and onlays. Our cosmetic dental team will work to preserve your natural tooth structure while ensuring you enjoy a better looking smile. The treatment plan we use helps save money, improves teeth, and eliminates the need for more invasive procedures.